U.S News & World Report just recently announced Michigan State University as No. 1 in the nation for elementary and secondary education. MSU has now carried this title for 19 consecutive years. This title is what drew me into the elementary program back in 2006. I’ve had many great experiences along the way, but the most memorable was my yearlong teaching internship. During my internship I also took course work that became part of my graduate credits. These courses included TE 801, 802, 803, and 804. Although most of my learning came from experience in the classroom, I also gained a lot of knowledge through the courses. When I look back to all 4 courses, one word comes to mind: INQUIRY. This was a word that was never apart of my vocabulary until my TE classes. Then I couldn’t get it out of my head! In TE 804 I developed a science learning community inquiry project. I distinctively remember this assignment because it has been very beneficial to my teaching today and I currently use the results in my classroom. In my first grade internship setting I struggled with classroom community. This was especially true when the children were asked to work in small groups. The problem for my assignment ended up being: How can I help students do a better job of participating in small group science activities and treating each other with respect during these activities? The next part of the assignment was to plan intervention strategies to develop a positive learning community. I discussed norms, made a T-chart, and had the children fill out an evaluation checklist. This intervention was successful because first we reviewed classroom norms and what it means to be respectful. With the T-Chart the children were able to practice and see what this type of behavior should look like. With the evaluation checklist, the children were able to reflect on their experiences. Small group norms need to be reviewed at the beginning of the school year. The self-evaluation sheet was one of the main reasons the group work improved. Young children have the ability to be very honest and always want to show that they are doing their best. I think this checklist can be modified to fit other grade levels as well. The younger grades can check-off the norms they think they completed, and the older grades can write the ideas they shared with the group. This is a great tool to help children become more reflective learners. Since my internship, I have used this checklist in my classrooms. This was an example of a specific inquiry assignment that I have carried into my professional teaching career. Since then I have based my teaching on inquiry-based learning as a whole. As a new teacher just starting off, I am always researching issues and questions to develop solutions. When I began my online MA program, I knew technology would be a crucial part to succeed in all classes. Even with a focus on literacy I knew blogs, chats, and the use of video would be incorporated. What I did not know was the plethora of new technology programs I would be introduced to. The class that really opened my eyes was Teaching School Subject Matter with Technology (TE 831). The final project in this course required the use of a new technology into a lesson plan for our classroom. I chose to use the technology Author Stream and Power Point for my final project. I am familiar with Power Point, but Author Stream is an extension to Power Point. Author Stream allows one to upload and share Power Point videos to a wider audience. Teachers can share a variety of content with their students while incorporating technology. Another reason why I chose to use this technology is because of the age group I teach. There is a lot of technology out there these days but not all of it is user friendly to Kindergarten children. Author Stream allows the teacher to share information and for younger children to be able to access it with ease. It is also something that they can work on independently. The teacher can incorporate graphics and even music to engage the students. I used the three TPACK knowledge areas while creating this lesson plan. I used Technology Knowledge by using Power Point and the Internet. I have been very familiar with using these tools since I was in grade school. I used Pedagogical Knowledge while thinking of my students and their learning style. I know that young Kindergarten students learn better when there is active and engaging lessons. I used Content Knowledge while presenting the accurate alphabet letters and sounds. I know that students in Kindergarten need to be working on letters and sounds right in the beginning of the school year. This lesson has many affordances of the technology related to education. One of the main reasons is its ability to share. I can upload this Power Point to the schools website and parents can practice it at home with their children. Special Education teachers can access it from their rooms as well. Author Stream is free and can be accessed on any computer. I also think that this lesson is very engaging. The students can actually sing along and see themselves (and other classmates) on the screen. Author Stream and Power Point can be re-purposed into any subject matter. It can be incorporated for any grade level as well. Teacher’s can create Power Point presentations with such a few easy clicks of a button. Now with Author Stream, Power Points can be uploaded and shared. Multiple computers can be used at one time as well as computers from home. I can imagine a science study guide being uploaded to Author Stream and the children being able to access it at home for practice. There is a broad range of ideas that may be used with this technology. This lesson contributed to my understanding of the TPACK theory. Effective teachers need to be conscious of all three knowledge areas. In the past I have done this lesson with Kindergarten children but instead of creating a link on Author Stream I just used paper and made a book. After learning about TPACK I understand the difference. I was able to extend the objectives and goals by including all there areas. You can view my lesson plan below as well as on my course work page. I chose to take the course Children’s Literature in Film (TE 838) as an elective towards my major in literature. I was starting to get an itch at the end of my program and needed to take a course that was unique and different from the rest. I was intrigued to take this course by just looking at the name “Children’s Literature and Film”. I did not know what to expect, but I was excited to throw film in the mix. The course was organized in modules where each week was different children’s books and films. The information from each week built upon one another that lead to a greater understanding. I feel that with all the modules pulled together, I am able to take away the notion that film is not just a representation of a text but also an interpretation. I started with the basics when the course first began. It was brought to my attention that not only can you “read” books but you can also “read’ film. This was not a concept that I had experience with before. 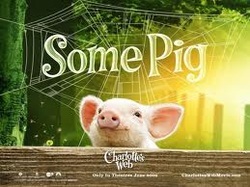 I began by using literary terms to talk about the book Charlotte’s Web. This was something out of the box for me. Literary terms are not used in everyday conversation. This goes the same for the film language that was used after viewing both of the films. I am very familiar with reading and viewing books that turn into film, but it was the language and perspective that varied. Usually I would compare one another by stating the obvious difference between what parts were omitted and then declare which version I enjoyed better. I was now able to use a bit more sophistication with my observations. I used this new language to support my claims with evidence from the text. The assignment that really helped me with this was when I was asked to re watch the Charlotte films (1973 & 2006 versions) for the second time. I was asked to look at it in a new way, only focusing on the film components rather than the content. It felt a little awkward and odd at first, but I can now say that I have grown to be comfortable with it. The “big idea” that I was able to take away from this course was that sometimes film versions reflect the literary elements of a book and sometimes they do not. The filmmakers are the ones who ultimately decide what is important to them and what is the message that they are trying to get across. They then create their own version of the written text. I can see myself using this “big idea” and transferring it in to my classroom to generate deep discussion. Even young elementary students will be able to benefit from an assignment like this. Mainly I think the children will learn how to ask relevant questions that will allow them to explore the material in depth. I would begin with comparing and contrasting the book and films. I would then ask them many open-ended questions allowing them to participate in a higher-level thinking. This excites me because I believe the children in my classroom would have the ability to do this. I especially would love to hear their ideas from another perspective. I do not believe that young children will be able to learn the literary and film language terms, but you could show them certain small sections of a film while focusing on one element. It can be replayed many times and the children can note their observation. I began this course with learning “how to” read a book and film and then segmented off to focusing on the relationship between a book and film. Lastly I was able to learn how children’s literature phenomenon is created. I have come to the conclusion that books and movies are from a different genre that makes it almost impossible to compare. Movies have different intentions than books do. This is why filmmakers provide their own interpretation of a book. My positive experience with the course has allowed me to understand that film is not just a representation of a text but also an interpretation.